Posted by sam daly in astroturf, climate bill, copenhagen, oilsands. The seas are swirling with mermaids’ fury against Monsanto and the corporate criminals who sabotaged the Copenhagen climate process. Mermaids know no borders. They swam it all the way to DC Wednesday to share their anger with the 3 winners of the “Angry Mermaid Awards“. We at the DC Climate Action Factory teamed up with a delegation of irate Danish anthrofishies and hit the frozen streets of K and I: global corporate lobby ground zero. It’s from here that climate criminals and climate profiteers staged their war to infiltrate and cripple the climate legislation that so many saw as the lynchpin for progress towards a real deal at the COP. Naturally, this place is home to the Angry Mermaid Award winners. First stop we hit it was API, the American Petroleum Institute. API came in at 3rd place in global interweb polling of over 10,000 homo sapiens sapiens and mermaids. API’s lobbying war chest weighed in at $4.1 million this year. Beyond the beltway, they fielded a mercenary astroturf army, lobbing lies at congresspeople and directing climate coverage in corporate media. All to perpetuate the fossil fuel economy that’s devastating the planet and threatening mermaids, humans, and everyone else who depends on natural temperatures and stable ecosystems. Apparently someone tipped them off, because we arrived to find the API entrance caution-taped. But nay, no length of ribbon could thwart our MERMAID FUNK ARMADA. We triumphed in delivering a 5ft. Angry Mermaid award inside the building despite heavy resistance from the astroturf army sentinels who tried in vain to blockade the entrance. But that’s all for another video. And so is our daring ascent up the highest steeple in the Church of Shell Oil, Jorma Ollila’s sustainable tar sands spa. Yes, we bested them too, the 2nd place winners. But that is also for another video. This is a 3-part series. What we can share is this: Exclusive footage of a daring fin and foot dance attack on Monsanto castle, 1st prize winners. We were victorious in our goal of decorating Monsanto’s terrific genetically modified Christmas tree with a life-size Mermaid trophy. But, alas, there were casualties on our side. Chalk another up for the murderous behemoth that is Monsanto. Monsanto is at the head of the corporate climate profiteers‘ counter-evolution, undermining sustainable technology by lobbying for false solutions to the CO2 emissions crisis. Monsanto’s prime false solution is leading the proprietary GMO biofuel monoculture empire. Similarly, Shell and API champion Carbon Capture technology and unconventional extraction like the Alberta Tar Sands project. Alongside the false solutions scam, the Angry Mermaid winners feed from another common trough: government subsidies for carbon-intensive economic sectors. All three winners benefit from fossil fuel, factory-farming, and military-industrial subsidies. The related industrial sectors, transport, industrial agriculture, dirty energy, manufacturing, and war, comprise the greatest emitters in the second-worse emitting country in the world. As people who depend on the land and water ecosystems in the United States and depend on the same oceans and atmosphere, we share in the rage of the angry mermaids. Thus the uncompromising beat of our global MERMAID FUNK ARMADA. We are unstoppable. And as with all things unstoppable, more action is on the way. The Angry Mermaid Award is organised by ATTAC Denmark, Corporate Europe Observatory, Focus on the Global South, Friends of the Earth International, Oilchange International and Spinwatch. Posted by skolmk in astroturf, cejapa. Today, the Senate Finance Committee held its first hearing for the Boxer-Kerry bill. News such as this would typically be welcomed as necessary progress, as we are pushing for strong climate legislation to pass through the Senate before Copenhagen. However, one must take into consideration ulterior motives when Senator Max Baucus (D-MT) is chairing the committee in question. Brad Johnson with Wonk Room called out Baucus on his indefensible submission to the “polluter lobbyists”, sharing the same sentiments as us that this hearing was supporting nothing more than the same empty rhetoric that has been spewed “time and time again for the past 10 years”. 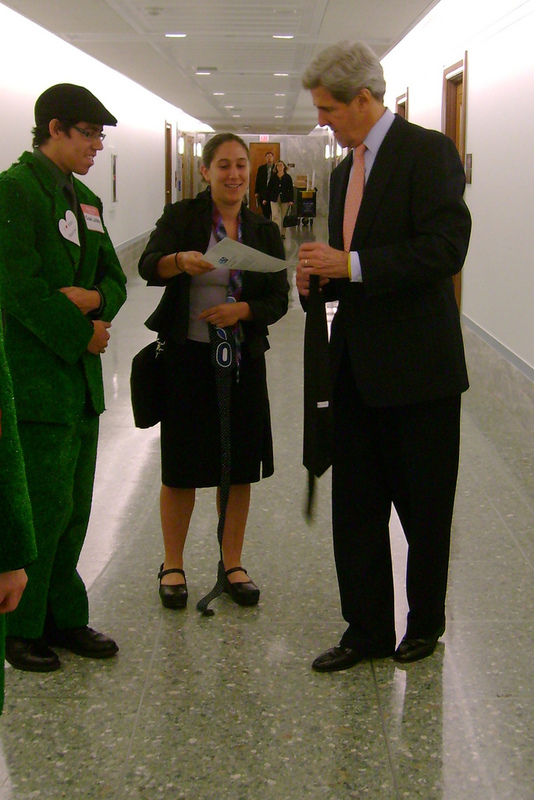 The action factory shifted into high gear, deciding that we had to bring Finance Committee Senator’s attention to youth demands and constituent calls for global climate action. 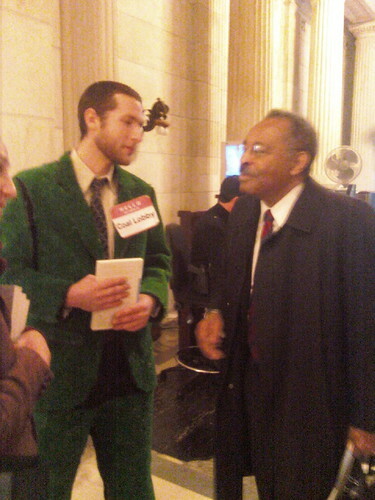 We arrived shortly before the hearing began, with some of us dressed in our now infamous Astroturf suits and others as real people demanding bold action on climate change from our leaders. 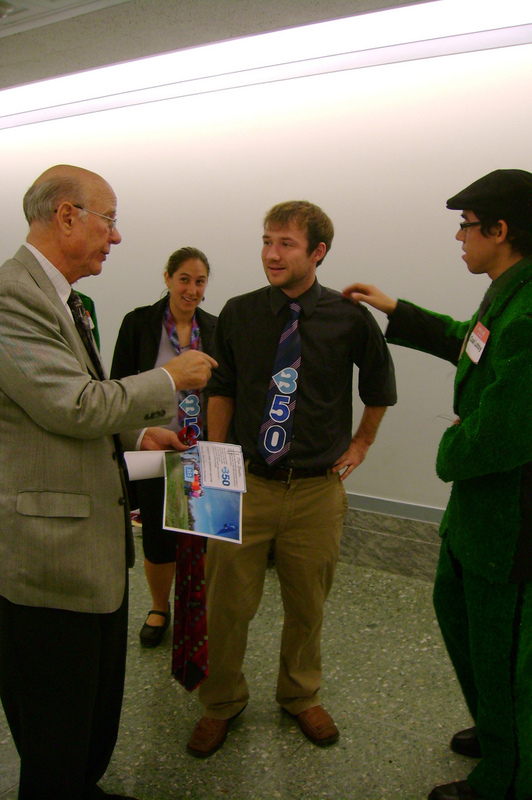 As Senators approached the Finance Committee hearing room, our real people for global climate action approached the Senators, handing them a 350 tie and a glossy photo from a 350 international day of action in their respective home state. We were lucky enough to have constituents in our group for conversations with Senator Cantwell (D-WA) and Kerry (D-MA), who both gladly accepted our pictures and ties. Kerry even scolded our Astroturfers, saying that there is already $10 million worth of provisions for the coal industry in the bill (yeah…great). Not all Senators were as receptive, though. Senator Roberts (R-KS) took a tie but argued against wind turbines in defense of migratory birds (yes, we also thought we would never hear that misnomer of an argument again). We also caught Senator Baucus on his way out of the hearing, and while he gladly accepts money from dirty energy lobbyists would not take a 350 tie from us. After saying he “supported climate change”, we challenged him, asking if he supported bold action against climate change. His response is best summarized by the title of this post- a lot of talk behind inconsistent action. Posted by skolmk in astroturf, bonner and associates. Hey Bonner & Associates- here’s what astroturf looks like! Today’s Congressional hearing shone light on the fraudulent letters sent to three congressmen on behalf of Bonner & Associates just days before the vote on the House energy bill (ACES) this past summer. In short, we investigated astroturfing. The unfortunate tactics employed by the opponents of clean energy to blatantly co-opt and misrepresent members of already marginalized communities- the NAACP, seniors, and women, amongst others – and undermined genuine grassroots efforts. In the same way that big tobacco once masqueraded the toxicity of cigarettes, Bonner & Associates led elected officials to believe that the groups most effected by the unjust realities of climate change and dirty energy were against passing provisions in the House to stop climate change and create clean energy jobs. While politics have never been pretty, there are certain lines you just don’t cross. Until today. 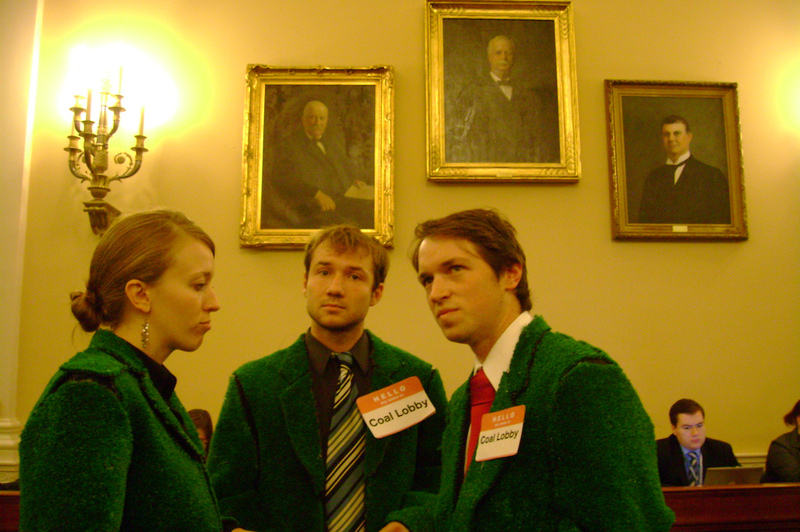 Three action factory fellows showed what today was really about: the coal lobby and their astroturf operation. The few supporters of Bonner and Coal were sitting just to our right, undoubtedly sweating as Jack Bonner and Steve Miller (President of American Coalition for Clean Coal Electricity) were tirelessly grilled by Sen. Ed Markey and Rep. Jay Inslee. We couldn’t help but smile every time Rep. Inslee interrupted Jack Bonner, requesting for the umpteenth time that he simply answer the question about whether he told his employees to lie. Steve Miller was similarly full of hot air as he stumbled between “ums” and “uhs”, attempting to dig himself, and the coalition he represents, out of a significantly deep pit of lies. It was suggested to Mr. Miller that in retribution for his company’s deceitful actions (and equally as harmful inaction) that he make an office visit to Senator Inhofe-a climate legislation obstructionist-lobbying for progressive climate legislation in the Senate. Or perhaps run a full page advertisement in a political publication supporting energy independence instead of clean coal technologies that don’t even exist. Hilarity ensued as both Bonner and Miller were left speechless by these suggestions, and the coal lobbyists to our right looked nervously at their feet. 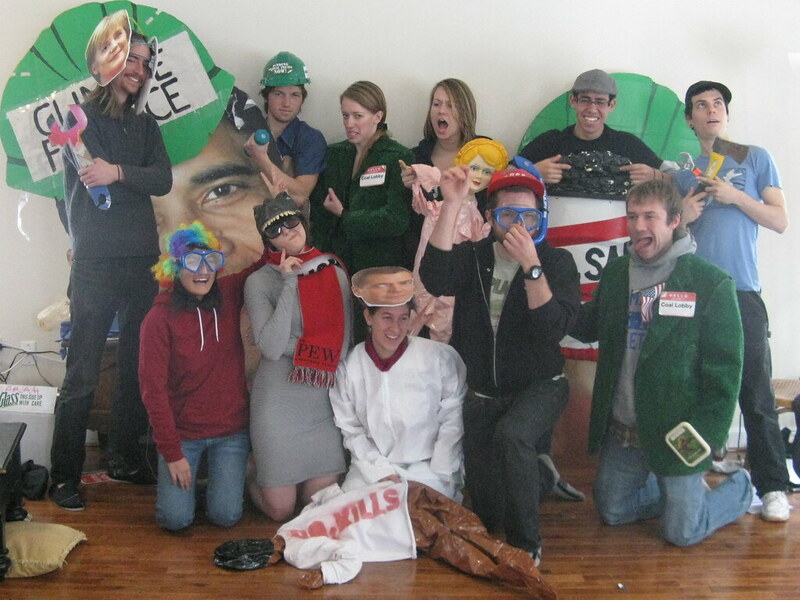 While the legal penance of the Bonner & Associates “hoax” has yet to be determined, the action factory fellows visibly exposed the astroturf efforts of these companies, complete with signs reading “Coal Lobby Poisons Democracy”. Until we can actually keep CO2 safely sequestered, we should keep the same big coal lobbying efforts underground- and nonexistent. Posted by Morgan in astroturf, bonner and associates. 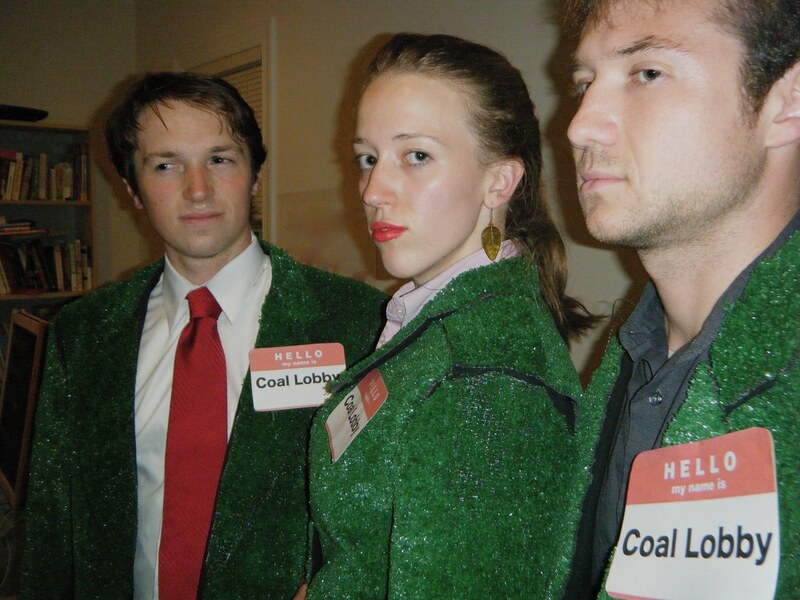 Climate Activists with the Avaaz Action Factory will wear astroturf suits to protest the fake grassroots support for coal industry. In June, Bonner and Associates, on behalf of the American Coalition for Clean Coal Electricity (ACCCE), was responsible for 14 forged letters sent to 3 representatives urging them to vote no on the climate bill. This extreme example of fake citizen support for big-industry policies, is part of a larger issue with corporations pretending to be real people. The coal industry has spent millions to try and generate ‘grassroots’ support for its policies, spending that is not reported as lobbying. The hearing is expected to examine both specific instances of letter forgery, but also the larger issue of undisclosed industry lobbying efforts. Current lobbying rules do not require firms to disclose clients for ‘public outreach’ work, even though it can translate into direct lobbying. Closing this loophole would effectively limit astroturf lobbying operations and bring democracy back to the people. It would also presumably limit opportunities for fraud, such as the fake letters sent by Jack Bonner’s company. Fake citizen opinion on legislation is dangerous for democracy, especially when companies stand to reap huge profits from the outcome. Furthermore, when companies can hide their funders, public accountability for these actions becomes difficult to enforce. Congressmen receiving forged letters: Rep Perriello, (D-VA) voted for the ACES legislation. Reps. Dahlkemper (D-PA) and Carney (D-PA) voted against it.